Spring is here !!! Today, I am really happy to show you some new interesting designs. I feel like a year is beginning with Spring, and that is why I feel so happy and inspired on spring time. I have some very interesting new designs I want to show you and I just waited for the right time to write this post. This bear was custom made for an exhibition ‘Bears- In honor of Spring’ , but unfortunately it wasn’t picked to be exhibit. I was kinda sad when I found out but I decided to move on and try to think positive. 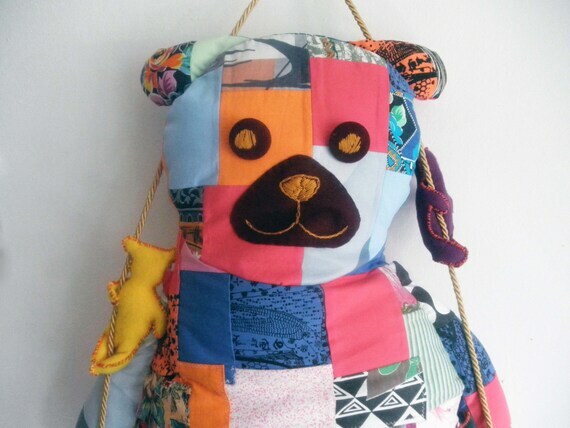 I worked very hard to make this bear and because of that I decided to put him on my Etsy shop. 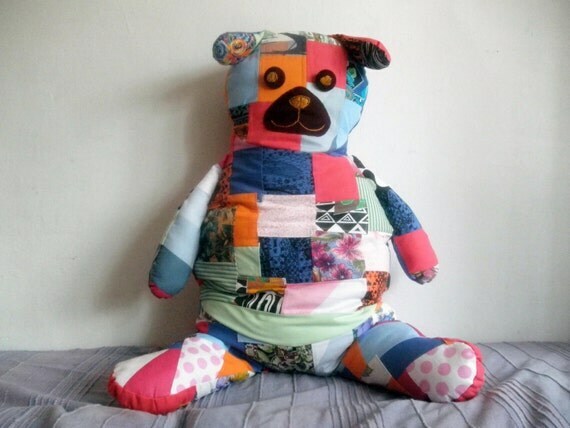 Maybe someone will like it and buy this cute patchwork bear. 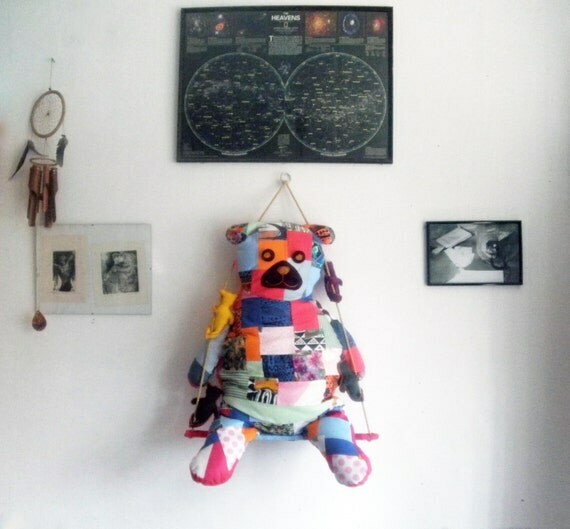 It’s made from 140 pieces of cotton fabrics and it’s stuffed just like a pillow, he is 100 cm tall. The idea was to make something interesting for children’s room but still can be used as a toy. This bear has his swing that he sitting on with four little stuffed bear friends who keep him company. Now it’s available on my Etsy shop. The second thing I want to show you on today’s post is something different from this bear but it’s still very decorative. I made this last year, but I didn’t finished till last month. I don’t know why and it’s not important. You can see this wall hanging now. It’s hand printed on a cotton fabric with my design. I used this print before on a bed cover and some pillows. I wanted to make something different from this print. 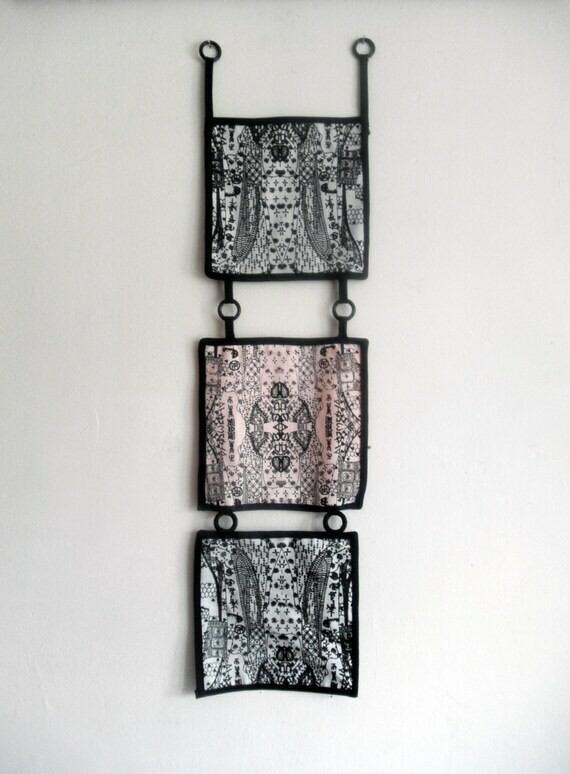 It’s hand printed triptych wall decor. Squares are 20 cm x 20 cm. This is also available on my Etsy shop. This is it for today. New blog post will be published soon. I will try to write more often and to share everything that I am working on.